Last week I was downtown for some errand-ing and I thought I'd pop over to Tokyo Grill and grab something quick to eat. This homestyle restaurant is a great, authentic little spot, that I don't eat at often enough because it's just too close to my favourite Japanese restaurant, Okonomi House. (Should probably write up a review of them sometime!) But in the blistering heat, it really wasn't an okonomiyaki kind of day, so off to Tokyo Grill I went, in search of something lighter. I don't think I've mentioned before how indispensable hiyashi chuka was in getting me through those hot Osaka summers. When it was pushing 30 degrees Celsius for days on end, I had no motivation whatsoever to eat. Cooking in my tiny, un-air-conditioned kitchen was a nightmare and while I did occasionally put my poor bentou-making skills to use, lunches were very often forfeited on the worst days. 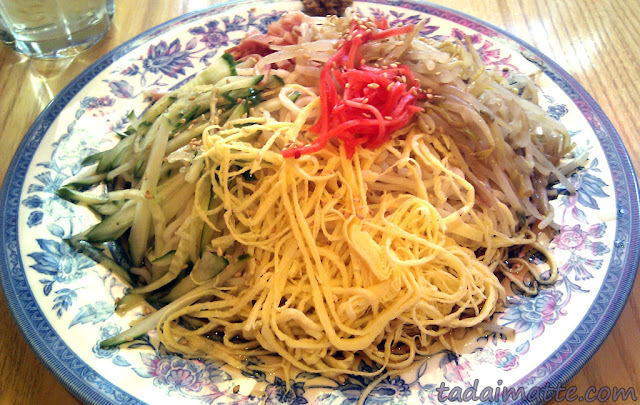 Until I discovered hiyashi chuka, that is - a lovely Chinese-style cold noodle dish, with strips of ham or chicken, bean sprouts, slices of egg and julienned cucumber mixed together with a sweet vinegar-sesame dressing. There were times when I ate hiyashi chuka at lunch for days on end. I craved it. And now, here it is, at Tokyo Grill in Toronto! I'll admit, the price was a huge turnoff. $11.99 is on the expensive side when you've been kicking ¥400 Lawson lunches for as long as I had. When the dish came, I immediately knew why the price was so high - this plate of noodles was enormous. It was certainly more than I could finish myself, even after an afternoon yoga class and walking all the way to their location near Wellesley from Broadview Station. On top of that, it was too much food to be comfortable for a summer lunch - one of the things I loved this dish for. If it were up to me, a half-plate at half the price would have been perfect. I'm told that Ajisen Ramen also does hiyashi chuka, though I haven't tried their version yet. I'll be sure to do that soon. As to whether I would recommend this, I would - the ingredients were great, the dressing tasted perfect, and the noodles (while I was surprised to find them white) were just the right consistency. My only advice to you would be to come with a very big appetite, or bring a friend!